In this video we will discuss implementing ListBox in asp.net mvc. We will be using table "tblCity" for this demo. Please refer to Part 38, if you need the sql script to create and populate this table. Please watch Part 38, before proceeding. The generated listbox should be as shown below. 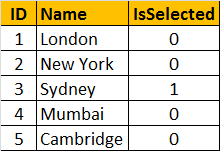 Notice that for each city in table "tblCity", there is an entry in the listbox. 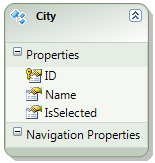 For this demo, we will be using the "City" entity that we generated using ADO.NET entity framework, in Part 38. The first step is to create a ViewModel class. In asp.net mvc, view model's are used as techniques to shuttle data between the controller and the view. Right click on the "Models" folder, and add a class file with name=CitiesViewModel.cs. Copy and paste the following code. This class is going to be the Model for the view. Right click on the "Controllers" folder, and add a "HomeController". Include the following 2 namespaces in "HomeController"
Copy and paste the following code in "Index.cshtml"
Note: To select multiple items from the listbox, hold down the CTRL Key. Your videos are very awesome and all the concepts are explained so nicely. Your tutorials make studying very interesting. Thank you so much. pleasee help me what should i do..